Eye Candy Hibiscus | Gurney's Seed & Nursery Co.
Strong, vigorous, 3- to 4-ft. plants are effective specimen plants along back borders. Large, white flowers form from midsummer until frost and feature deep red eyes with touches of pink. Disease and pest resistant. Zones 4-9. Potted plants. Height: 3 - 4 feet, cone shaped growth habit. Spacing: 2 1/2 - 3 feet. 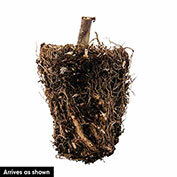 Depth: Set at the same soil level it is in the container, firm and water thoroughly. Spread: 2 1/2 - 3 feet. Color: Bloom has white pistol and stamen, deep red eye, moving to a white starburst, fading into a pink band. Blooms: Mid Summer until frost. Zone: 4 - 9 ( -20 F.). 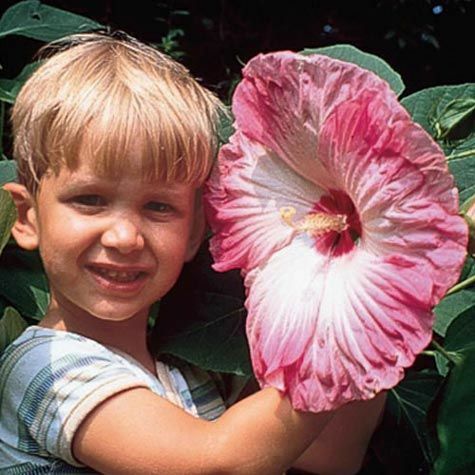 Flower Form: Large, cup shaped, ruffled to wavy petals, 11 inches across. Soil Requirements: Well-drained, humus enriched soil. Will tolerate wet soils. Comments: A sweet treat for your garden with striking coloration on gigantic blooms. Although this is a herbaceous perennial, because of its size, it can be used in the same way a shrub would be and makes a wonderful focal point in either a border or as a specimen plant. Good resistance to most pest and disease problems. Liked by butterflies. Strong, sturdy plants will hold up to the weather without any flopping or drooping of the stalks. Superior, uniform selection.